Guruji Shri Narendra Babu Sharmaji has started new section in his Bruhat Brahmanda programme called Ashtadasabhuja Durga Darshana. In which Guruji reveals the details on Lalitha Sahasranamam. Guruji have divided the Lalitha Sahasranamam into 18 sections, he plays each section and reveals the Goddess Durga Temple related to it. 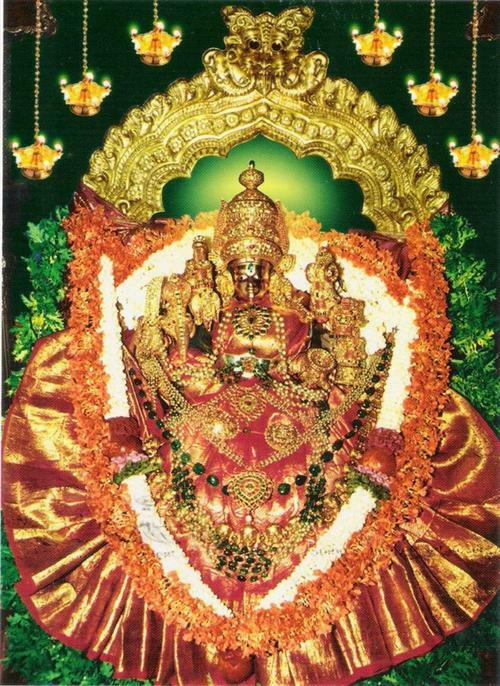 The Fifteenth Temple in Ashtadasabhuja Durga Darshan is Chamundeshwari Temple - Mysore. The Lalitha Sahasranama verse played by Guruji, is given below. The ancient city of Mysore as mentioned in the Devi puranas/stories of goddesses, was ruled by the wicked demon Mahishasura. He had a boon that no man on this earth could kill him. The citizens prayed to the gods and goddesses to save them from the atrocities of the demon king. Goddess Parvathi heard their pleas and in order to rescue them, took birth as Chamundeshwari and killed the demon. Hence, she came to be known as Mahishasuramardhini (the one who killed Mahishasura) and the Devi permanently stayed back in the hill to protect the land. The city was thus called Mahishapura/Mahishuru. The hill came to be known as ‘Mahabaladri Hills’ and later was renamed as Chamundi Betta/Hill, after 17th century. The hill is approximately 1,095 meters high with a road leading to the top of the hills. Climbing the hills can be fun and a test of endurance. Maharajah Dodda Devaraja has built 1,000 steps in 1659 to the temple. It takes 30 to 40 minutes to climb up and the view of Mysore city on the way is beautiful. 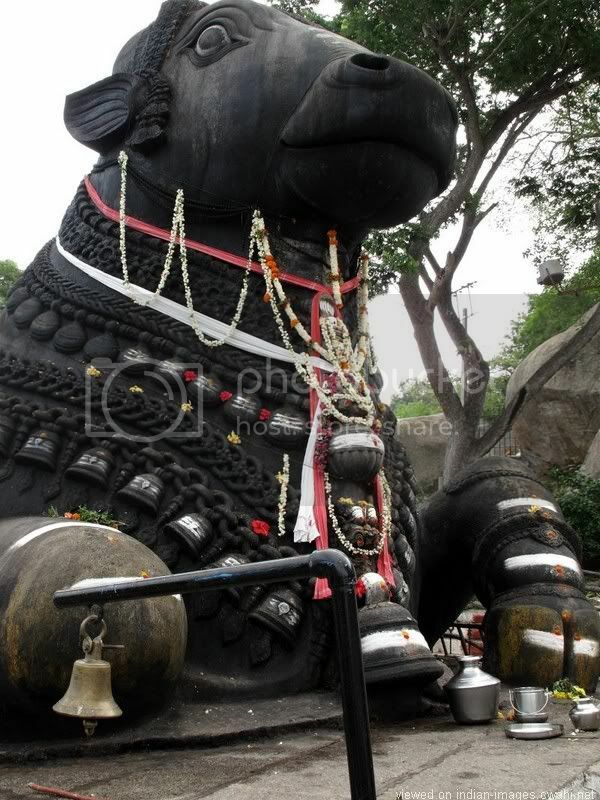 After climbing 800 steps a colossal Nandi the vehicle of lord Shiva greets you. It is 15 feet tall and 24 feet wide. You can also drive up to Nandi. Well-known places can be seen from atop the hill like, the Lalitha Mahal Palace, Mysore Palace, Karanji and Kukkarahalli Lake etc., On Sunday evenings, stand at a strategic point where you can view Mysore palace and as the clock strikes 7:00, the palace comes alive as its 96,000 bulbs will be switched on. The view from uphill is awesome. The temple has a beautiful idol of Goddess Chamundeshwari and many palace jewels have been donated to the shrine by the Maharajahs of Mysore. Krishnaraja Wodeyar III in late 18th century built the temple tower and presented the Nakshatramalika jewel to the goddess with sanskrit verses inscribed on it. There is a shrine dedicated to Mahabaleshwar/Shiva beside the main temple, which is built by the Hoysala king Vishuvardhana in the 12th century. There is another small but beautiful temple dedicated to Sathyanarayana/Vishnu. A trek of about 600mts down hill in front of the temple will take you to Devi Kere the sacred water tank. The annual rathothsava (car festivals) is held on the full moon day in the Hindu month of Ashwina. Thousands attend the ceremony, which falls in the month of October. When you drive uphill and reach the temple, you will see an imposing and perfectly proportional statue of Mahishasura painted colorfully with a snake in one hand and a sword in the other. This is a favorite spot for tourists to take group photos with the demon in the background. Many children over the years have been scared of this overwhelming figure. At the highest point of the hill lies the Rajendra Vilas palace built by the kings. The hill is always identified with the palace on top of it. Whether it is a drive or a trek, a visit to Mysore is complete with a visit to Chamundi betta for the blessings from the Nada Devathe/Goddess of the region. Transport: Buses ply frequently to the top of the hills, private cars and taxis, Timings : Open all 7 days a week. Archane - 11 a.m. to 2 p.m. & 4 p.m. to 6 p.m.
Special Aarti - 7 30 a.m.
Abhisheka - 6 a.m. to 7 30 p.m. @ 6 p.m. to 7 30 p.m.
After visiting Chamundeshwari temple you should visit Nimbujamba Temple in Nazarbad, Mysore- 570010. Their is a lamp made up of stone which holds 135 litres of oil. After seeing the lamp you should visit Nimbujamba Devi.